LI Newsday Executive Suite March 23, 2015 - The Dollicia F. Holloway Memorial Foundation, Inc.
 Back to Dollicia In the News! Dollicia has done it again! 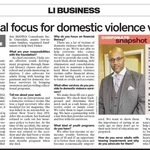 Today we celebrate a corporate snapshot of Keith H. Burgess, recognized CEO in Long Island’s most read paper, Newsday, for the Dollicia F. Holloway Memorial Foundation, Inc for his outstanding work assisting the domestic violence community. We’d like to thank our supporters because we could not do this without you!